Lord Ganesha is the deity who is worshipped whenever a new activity is commenced, whether it be religious or secular. His puja ensures that all obstacles impeding the success of that particular enterprise are totally removed. Hence, one of Ganesha’s name is ‘Vighna-harta’, meaning the remover of obstacles. Lord Ganesha is a Vedic deity and his mantras mentioned in the Vedas form an integral part of his worship. In fact, so timeless is Lord Ganesha that the Ramacharitmanasa states that when Lord Shiva and Parvati were about to get married, they first worshipped Ganesha and only then did the actual ceremonies begin. Another reason for the fascination with Lord Ganesha is his apparently strange, composite form, consisting of an elephant head complete with a trunk, resting on a human body. His trunk is always curved earning him the epithet ‘Vakratunda’, and his body always plump, giving Lord Ganesha the name of ‘Mahakaya’. He is always attended by his faithful mouse, who is his constant companion and also doubles up as his vehicle. 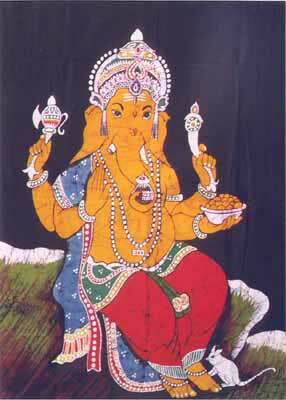 Thus an image of Lord Ganesha combines within itself the hugeness of the elephant with the minuteness of a mouse. As far as the birth of Lord Ganesha is concerned, he is said to have been created by Goddess Parvati to guard her privacy. When Ganesha did not allow even Lord Shiva to enter his mother’s chambers, the former, in a fit of rage, cut off Ganesha’s head. Later, in order to supplicate his wife’s wrath, Shiva replaced the head with that of an elephant, and also made him the leader of his followers known as ganas. Hence did Lord Ganesha get the name ‘Ganapati’, meaning the head of Shiva’s followers. 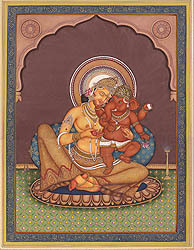 Iconographically, Lord Ganesha is often shown with one of his tusks broken. There are many stories behind this strange depiction. One of it states that Ganesha lost it in a battle with the great sage Parashurama. Another has him throwing it at the moon who was making fun of Ganesha’s prodigious appetite. It is these kind of numerous tales about Shri Ganesha that have continued to charm children and adults alike since time immemorial. Ganesha is said to rise out of the waste of the herbal paste rubbed by Parvati off her body. As the scriptural tradition has it, Lord Shiva was often away and a lonely Parvati was as often occupied by thoughts of a son who could by his company relieve her of her loneliness. One day, when bathing and absorbed in similar thoughts, Parvati inadvertently moulded the herbal paste she removed from her body into a tiny anthropomorphic figure. The idol in hand Parvati wished it had life, and the other moment the idol transformed into a living child.